Get your putters out, it’s time for some golfing with a cause! Being part of a community means getting involved. 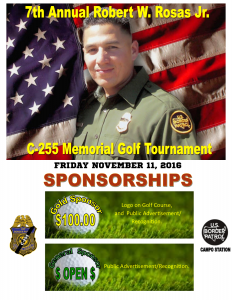 And one of the ways 911 Restoration El Centro gets involved is by sponsoring local events like the 7th Annual C-225 Memorial Golf Tournament. The C-225 Memorial Golf Tournament is an event hosted by the Campo Border Patrol Station Welfare and Recreation in an effort to raise funds to provide scholarships for college-bound students and for the families of US Border Patrol officers who were killed in the line of duty in Imperial and San Diego counties. The event is to be held on November 11 at the Imperial Palms Hotel Resort at Barbara Worth Country Club. This golf tournament has been held since 2009 and has raised over $30,000 for scholarships for students in need and has raised over $50,000 for the families of service members of the border patrol. During last year’s tournament, the event raised money for the Trevino Family of Holtville, CA who lost their daughter to stomach cancer. For this year’s event, the money raised will go to another family in need of help. For such a noble cause, 911 Restoration has pledged and is proud to be one of the gold sponsors of this event. Being part of this community means supporting it and that’s what our Fresh Start attitude stands for: giving opportunities and helping so people can have a brighter tomorrow ahead. As a member of the El Centro community, you can always count on 911 Restoration Imperial County to lend you a helping hand in raising funds for education, families of fallen service members, and in restoring your home after leaks or floods cause you trouble. For your restoration needs, give 911 Restoration a call today! We’ll see you on the green!